Nagoya-Los Angeles Sister City delegation luncheon at the Los Angeles City Hall in Los Angeles, California, October 1969. Group of Caucasian and Japanese men and women sit at a long table covered with cups and papers. 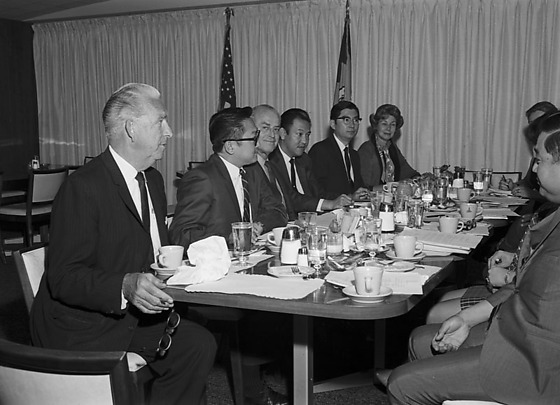 George Saiki, representative of Los Angeles Mayor Sam Yorty, sits on left side of table, second from right in suit and eyeglasses. James Nakagawa sits on right side of table, second from left. American flag and another flag in background in front of draperies. Typed on original envelope: Nagoya Sister City -- Luncheon at City Hall.